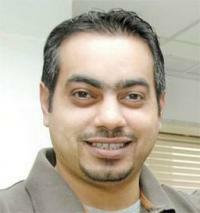 Bashar Al-Sayegh is a Kuwaiti journalist for Al-Jareeda newspaper as well as a blogger. On August 19, 2007 he was arrested by plainclothes police for a comment posted on an online forum he provides ((Alommah)). Al-Sayegh had removed that statement only 15 minutes after it was made by an anonymous author, because it defamed the Amir of Kuwait, Shaikh Sabah Al-Ahmad Al-Sabah ((The Kuwaiti » Free Bashar!)). When the police arrested the journalist at Al-Jareeda’s offices, his colleague Jasim Al-Qames started taking photos of the situation and was subsequently taken into custody. While Al-Qames was released one day later after blindfoldedly signing a confession using his fingerprint as a document, Al-Sayegh was held in custody for three days until he agreed to sign a confession and give the IP of the comment’s author to the police ((Muslim Media Network » Held Accountable)). Meanwhile it had been reported that he and his colleague had been beaten by the police. However, the blogger later denied that fact ((The Kuwaiti » Free Bashar! )), supposedly to avoid further action against him and claimed Al-Qasem had been the only victim ((كلبونا جماعه » Bashar Al-Sayegh and Jassim Al-Qames Harassed and Attacked by Secret Police in Kuwait)).